Crop tops are short and mostly well-fitted tops that end above your midriff, imparting a strong sense of chic fashion. Depending on whether you have toned abs or not, you may team them up with high or low waisted bottoms like skirts, jeans, and shorts. Experimenting with their sleeves and necklines is also a fashion-friendly way to look glamorous, just like top models on magazine covers. 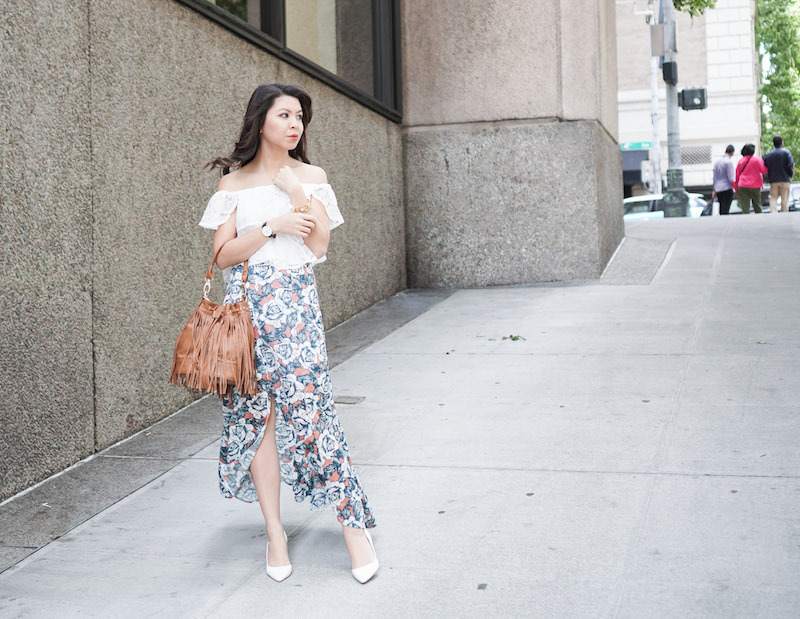 Maxi skirts: Long satin gowns worn together with contrasting crop tops look dressy. A cream top and a crimson skirt is a beautiful combination for a gala evening reception party or a bridesmaid attire. The only peek-a-boo factor, being the midriff, enhances your look. Plus size women, instead of sleeveless tops should go for turtleneck tops with full sleeves. Sometimes, for winter, you may try woolen tops and long skirts. Peplum Skirts: Body-hugging peplums and halter neck crop tops make a wonderful silhouette for all women. The mermaid-like effect will slim down your wide waist and chubby thighs. Horizontally striped skirts and monochromatic crop tops look good on tall women. Short girls may opt for skirts having ruffles at the end of the hemline. Instead of peplum skirts, you may go for bandage skirts as well. Skater Skirts: Short skater skirts or circle skirts complement crop tops like anything. Exposing your midriff and legs is a sure-fire way to look taller. Also, the material of the skirt gives you a different appearance. For example, a lacy skirt along with similar crop top or an embellished one preferably with a halter neckline makes you appear as a docile school girl, while a leather ensemble is sure to give an edgy vibe. Denim shorts or cotton shorts go well with any kinds of crop tops. While a pair of ripped shorts conforms to rusticity the delicate crop top will balance it off with its urban look. For a black crop top, dark blue denim shorts will work best. For monochromatic outfits, try white shorts and white crochet tops. You can layer the look along with a flannel shirt. If you are willing to experiment, then choose a solid colored top and select high waisted floral or Aztec short pants. Wearing them with suspenders will also enhance the look. If you wish for a different approach, then select a colorful Ankara printed top and pair it with a simple pair of shorts. Boyfriend Jeans: The loose and baggy jeans, contrasted against fitted crop tops, make a well-balanced outfit. For a winter dinner party with friends, go for crop sweaters in white and light blue acid washed boyfriend jeans. High Waisted Jeans: Flabby women who are not comfortable in showing their rounded tummy may dress up in high waisted jeans. High waisted cropped jeans would also be viable options for the same purpose. Flare bottom jeans with lacy crop tops are an elegant combination. Skinny Jeans: Ankle-length skinny jeans and knit crop tops have a synchronized look altogether. Be it a casual day out or a night out, this attire is simply the best. For a windy time, make it a layered dress by wrapping an infinity scarf and wearing a jacket. This particular style can be a classy airport look as well. Wearing crop tops with palazzos and trousers are also “in,” but what makes the top a sought-after option is the comfort they provide. While for summer you wear cotton crop tops, for winter, there are crop sweaters, even crop hoodies. Also, a beach vacation will remain incomplete if you don’t wear crochet crop tops with apposite bottoms like similar high waisted shorts and sarongs. For even more casual appearance, joggers pants could be a nice alternative to jeans. Since the essence is more or less same, you can be creatively liberal and enjoy every outfit you pull off.